This is where you will find John's real view of the Global War on Terror. It wasn't, and isn't, possible for any of the various counter-insurgencies, civil wars, and bush wars currently raging in the world to bring down the United States of America. To think so is to fundamentally misunderstand the nature of power in general, and America's power in particular. The alternatives currently on offer simply cannot fill the mental space that America currently occupies in the world. None of our declared enemies have the ability to bridge that gap, let alone dislodge us from our position. This is not to say that America deserves to be on top because it is better, or that our enemies merit failure because they are wicked. The argument is simply that civilizations exhibit something very much like a lifecycle, and not all things are possible at all times and all places. This argument at least has the benefit of empirical evidence, although the sample size is small. However, there is a viable alternative. It is simply not a visible alternative. And that is all part of the plan. I used to find John's discussions of Tradition rather mysterious. What exactly is this Tradition thing? It is not the people you usually find called traditional, or traditionalists. John often referred to René Guénon and Baron Julius Evola, but they just seemed marginal figures of European history. Who exactly is it that subscribes to the one twentieth century ideology that never had a state? Then I met a man who did. While there are groups that promote one or more aspects of the Politica Hermetica, there is no great conspiracy behind it. René Guénon called it "Tradition," which comes close enough, though even that exaggerates its coherence. In any case, it is a mode of thought that political science tends to overlook. It is characterized by self-appointed elites who represent a cause rather than human constituents. This implicit devotion to hierarchy, however, coexists with a tactical anarchism. This is the world of "direct action" anarchists, but it is not confined to them. No doubt we have all met "conservatives" who would not leave one stone of the modern world standing on another. Their loyalty is not to this world, but to a transcendent realm. If they are conventionally religious, they adhere to some ineffable orthodoxy that excludes most of their nominal co-religionists. To some extent, this is just a matter of personality type. Still, when we find such people, I suspect we will often find some direct ideological influence from writers associated with Tradition or the Conservative Revolution. Ah. That described him perfectly, and explained why I felt so odd about him. I had read this twelve years ago, and while my memory isn't what it used to be, I doubtless retained at least some faint memory of it. That memory served as a Gestalt, even as faint as it was. This was a man who would destroy everything; he would not leave one stone stacked upon another. Sometimes you hear that the left-right political spectrum is not a line, but a circle. Tradition is where the two lines meet. I don't believe that we are experiencing a crisis of capitalism, or that we could be defeated in the current Jihad. I think this way because I believe that capitalism and liberal democracy are strong. However, many people seem to think that the success of liberal capitalist democracy is assured simply because there is no alternative. The worst outcome they can imagine is a spate of "chaos" until the liberal order is restored. I increasingly appreciate that this is not the case. The outcome might not be chaos, but a quite different order. Francis Fukuyama was largely correct in The End of History: communism, and even socialism, have been permanently discredited. The events of 1989 really did constitute the end of the line of ideological evolution that began in the Enlightenment. Communism today is not an alternative. However, one might argue that it was not a likely alternative even in the 1930s, which was the last time the real alternative surfaced. It's too simple to call the alternative "fascism." The fascist states of the first half of the 20th century still had mass political cultures; to some extent, they remained parodies of democracies. At their hearts, however, there was the esoteric alternative. For lack of a better term, we will call it the Politica Hermetica (which should in not be equated with the journal of that name and the annual symposium that deals with the subject). It antedates the Enlightenment, though of course it has undergone development over the last two-and-a-half centuries. Nonetheless, it has a content that is not merely reactionary. I mention this now because bits of the Politica Hermetica keep turning up in the news. There is the esoteric Islamic connection, which had a long history even before the postwar fascist-Muslim links. There is the reunification of Europe, which might seem like a good idea on the merits. There are the increasingly successful attempts to remove the Catholic Church as a public voice. In some ways, the most alarming development is the attacks on capitalism and the market. Though some commentators don't seem to appreciate the fact, the Politica Hermetica has always appeared on the left as well as the right, among Greens as well as Black Metal fans. My own problem with the Politica Hermetica is that I find parts of it intrinsically attractive. The Perennial Philosophy, as explained by Aldous Huxley's book of that name, is a sunny doctrine. It is more or less explicit in the work of writers I admire, such as Robertson Davies. As for its political implications, I think it is one of those "self-evident" truths that government requires some transcendent basis; even democracy is not self-legitimizing. For that matter, I am also one of those people who keep referring to the impending "end of modernity." The Politica Hermetica makes similar assumptions, but then takes them to places where no sane person would want to follow. What happened in the 1920s and 1930s was that many did follow, because they did not know that there were such places. In those days, when people despaired of democracy and capitalism, they thought the alternative was some familiar form of authoritarian government. Even those who supported "socialism" did not understand what a break with the past it would mean. At the international level, the respectable great powers laid aside their informal policing roles in order to deal with their internal problems. They thought that the worst that could happen would be distant disorders, of little interest in a world of diminished global trade. The scope of the disaster was made possible by a failure of imagination. There is no great wave of political hermeticism poised to overwhelm Western civilization, but then neither was there one 75 years ago. My point is that, when the system imploded, the result was not Bolshevism, or chaos, or a return to the virtuous past. Rather, an alternative way of organizing the world seemed to appear out of nowhere. In fact, it had been there before. It's still there now. Sometimes, I worry that I'm not the hero everyone thinks I am. What would they think if they knew that their champion—the Hero of the Ages, their savior—doubted himself? Perhaps they wouldn't be shocked at all. In a way, this is what worries me most. Maybe, in their hearts, they wonder—just as I do. The Final Empire is not a happy place. The teeming masses of the Empire, known as skaa, are used to clear the brown fields of the ash that falls from the sky without cease. Their unending toil brings only meager sustenance from the scorched and blighted land. When their labor is done, night falls, and the mists come. Each and every night, the world is wrapped anew in terror and mystery. Even the stout-hearted quail before the creeping tendrils. Few willingly venture outside after dark. The life of the skaa is nasty, brutish, and hopefully short. Skaa labor provides what few luxuries the land can provide to the hereditary aristocracy. Despite their relative paucity, the aristocracy find their entertainment inadequate. Bloodsport and sexual exploitation fill the gap. The nobility are themselves watched by the obligators, the omnipresent Imperial bureaucrats who must witness all agreements, financial or otherwise, between the nobility. The obligators are in turn watched by the terrifying Steel Inquisitors, creatures of flesh and metal who report directly to the Lord Ruler himself. None dare resist their power. One thousand years after the Hero of Ages traveled to the Well of Ascension to save the world, all is not well. Society shambles on, but it is dead, feigning the symptoms of life. It is the time of the final cultural forms, of petrified urban-dominated society (the part of the cycle to which Spengler gave the name “Civilization” as a technical term). There is no theme to the events in the Winter: there is a lot of art and politics, but it is powerdriven, market-driven, fashion-driven. All these events simply toy with traditions and motifs which the culture created when it was alive. Usually something ghastly happens to civilizations which reach this fossil state, but according to Spengler, this something comes from outside. A friend recommended this book to me as something similar to Patrick Rothfuss' The Name of the Wind. I had been waiting for a copy to show up at my local used bookstore, and I finally found one just before Thanksgiving. That is an apt comparison, the books have somewhat similar magic systems, were published about the same time, and they were both a blast to read. Other than that, these books are completely different. This is a good thing. I really enjoy seeing similar ideas worked out in very different ways, by authors with entirely different styles. The Name of the Wind and it's sequels have a laser like focus on Kvothe; which is appropriate, since these books are the story of his life. Other characters appear, but they are always secondary to Kvothe. This fits, since Kvothe is a narcissist. Everyone else really is secondary. Sanderson, on the other hand, has an ensemble cast who all are fully part of the story, with their own plausible motivations and desires. They are not simply part of the scenery, but rather provide a richness of detail that makes the story seem more real. Sanderson also does a really good job with politics and applied psychology in this book. Deceit, manipulation, and Machiavellian politics are a major part of the story, and I loved it all. Actually, there is one other way these books are alike; they are both about the end of the world. I know, there he goes again. 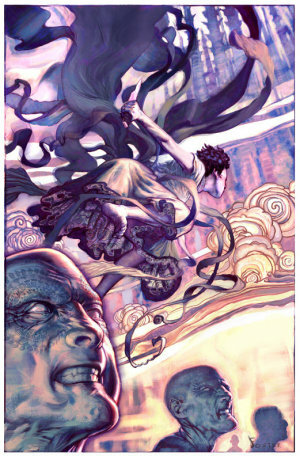 Mistborn is the tale of the brave and doomed skaa resistance to the reign of the Lord Ruler. Following the introductory apocalypse at the Well of Ascension, the Lord Ruler consolidated his dominion over the entire world. This really is the end of history, for in the Final Empire, nothing every changes, including the immortal Emperor. The Lord Ruler's grasp may grow somewhat weaker as you travel further away from his capital, Luthadel, but there are none who do not acknowledge his sovereignty. In typical usage, a millennium is a thousand year period of peace and prosperity after the constraints of the human experience, such as war, death, and poverty, have been overcome. Sanderson has turned the concept on its head, positing a millennium where the forces of evil have triumphed instead. The Three Horsemen run rampant in the Final Empire [only War has been vanquished; War against the Emperor is inconceivable]. This kind of millennium poses as the end of history, but it is really a pregnant pause. A millennium of this kind implies a nameless war to follow, a revolution after the revolution. The Final Empire reaps this in plenitude. In the book of Revelation, the thousand year reign of Christ comes to an end when Satan, who has been bound, but not destroyed, rises again. He will be defeated in a nameless war after the end of the world, after which the cosmos will be consumed. Sanderson fulfills the archetype completely; the paradigm will out, even when you start out to subvert the idea. What Sanderson does maintain, the reason why I enjoyed the book so much, is the identity of good and evil. Good still wins out in the end. What remains the same is that the cosmos is consumed in the resulting conflagration. Only now, a new cosmos needs to be constructed to replace the old. This is the task the protagonists find they have created for themselves. It should prove to be most interesting. I enjoyed this book so much that I am eagerly awaiting my next trip to the bookstore to buy the rest of the books in the series. If you have a hankering for more, you are in luck. The other two books in this trilogy are already written, and Sanderson has even greater plans for extending his ideas into a grand overarching story with more than thirty volumes. This is a venerable conceit. Writing stories that fit into the same universe is a mental savings, and fun for your fans as well. I look forward to exploring Sanderson's creations.